People struggling to lose weight sometimes turn to their doctor and ask about medication. Since 1959, doctors have been prescribing phentermine to help those on their weight loss journey, which works by suppressing the appetite. However, like many prescription medications, phentermine may cause side effects, ranging from dry mouth to chest pain. While many weight loss options are available, you should first talk to your doctor to determine which weight loss plan might work best for you. Phentermine is an appetite suppressant that works on chemicals in the brain, specifically in the hypothalamus -- the body's appetite control center -- to help decrease the desire to eat and assist with weight loss. While the pill might help you eat less, a low-calorie diet and exercise plan are also recommended to those prescribed the medication, according to MedlinePlus. Doctors also suggest that you are offered the weight-loss pill only if you are overweight or obese, which means a body mass index of 26 or greater. When part of a weight loss plan, phentermine has been proven to be effective at helping people lose 5 percent or more of their usual body weight in 14 weeks, according to a 2006 clinical study published in the Yonsei Medical Journal. As a weight-loss medication goes, phentermine is considered tolerable by most people; however, it may cause some mild side effects. The most common complaint among users is a dry mouth. 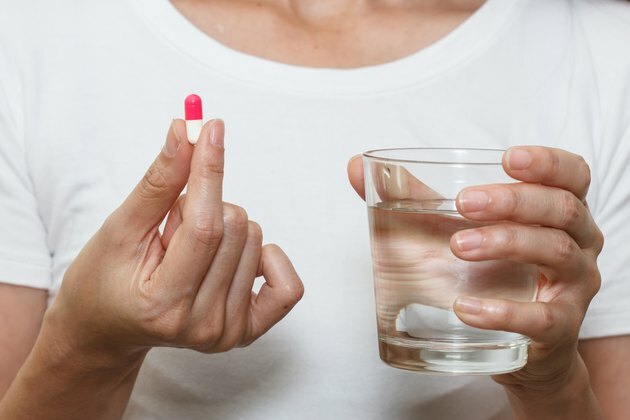 Phentermine also causes an unpleasant taste in the mouth, and users may want to keep a bottle of water handy when taking this weight-loss pill. Other common mild side effects include constipation, diarrhea, headaches, changes in mood, nausea or vomiting, dizziness and fatigue. Unfortunately, phentermine isn't the right fit for all dieters and may cause serious side effects that require a doctor's intervention. Anyone taking the prescription diet pill who experiences an increase in blood pressure, heart palpitations, shortness of breath, fainting, tremors, insomnia, swelling of the ankles or legs, trouble exercising or doing everyday tasks should call their doctor immediately. Also, because concerns exist that the drug may be habit-forming, it's recommended that you take it for a set period of time, three to six weeks, or as determined by a doctor. And you should only take it as prescribed, not in larger amounts or for longer periods of time. Even though phentermine is approved by the Food and Drug Administration and is considered a safe medication for weight loss, it's not for everyone. Because of its effect on blood sugar and blood pressure, phentermine shouldn't be taken by people with diabetes or kidney disease. It's also not recommended for people with an over-active thyroid, also known as hyperthyroidism, because the medication may worsen the condition. And because alcohol exacerbates phentermine's side effects, you shouldn't drink alcoholic beverages when taking it. Because it may cause drowsiness or a false sense of well-being, you should also not drive a car or operate any heavy machinery when first taking phentermine, until you know how it affects you personally. Is it Safe to Exercise While Taking Phentermine? What Are the Ingredients in the Phentermine Diet Drug?